Kindergartners in the Italian town of Arcugnano have a new reason to enjoy recess. Artist Okuda San Miguel has bathed their school in a colorful series of murals marked by prismatic shapes and larger-than-life animal caricatures that almost appear 3D! A sensory delight for young minds, the tall textures, and sundry of colors make for a visual playground for young learners. Okuda San Miguel’s art can be admired across the globe, as he has painted strokes of vibrant genius in locales from Mexico to South Africa and the United States to Mozambique. Using the walls of this Italian kindergarten as his canvas, his five murals bring to life bears, birds, a winged lion and more vibrant creations. The dazzling color spectrum and the cheery subjects of San Miguel’s street art-turned-school-ground canvas evoke happiness and beckon playfulness. Usage of windows and doors as the bodies and orifices of each geometric animal brings about cartoon-like life in simplicity. Resting in the vulnerability of open space, the psychedelic color-zoo of imaginary animals appear as organic symbols to invite kids to use their imaginations. This is a place to be remembered — where early friendships are formed and learning happens in real time. Kindergartners in�the Italian town of Arcugnano have a new reason to enjoy recess. 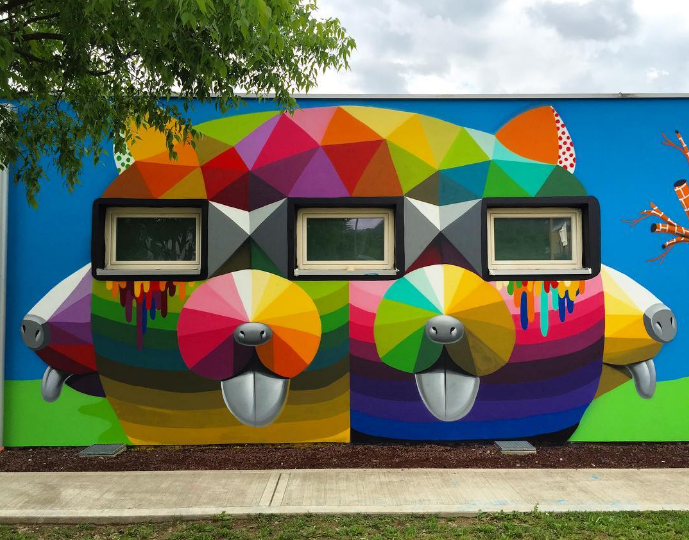 Artist Okuda San Miguel has bathed their school in a colorful series of murals marked by prismatic shapes and larger-than-life animal caricatures that almost appear 3D! A sensory delight for young minds, the tall textures, and sundry of colors make for a visual playground for young learners. 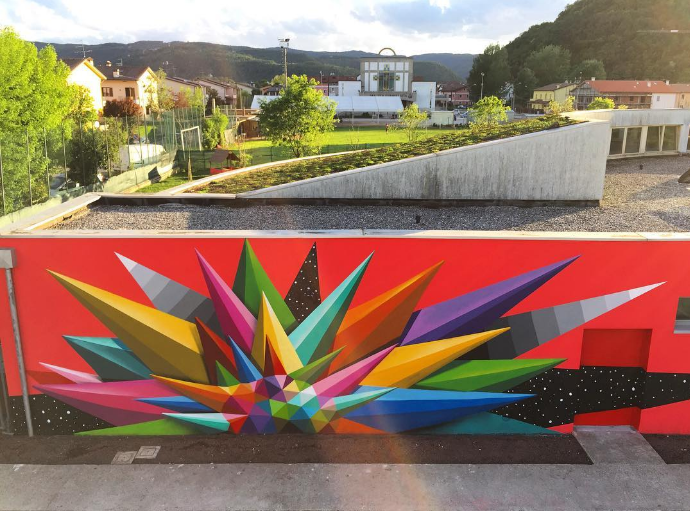 Okuda San Miguel's art can be admired across the globe, as he has painted strokes of vibrant genius in locales from Mexico to South Africa and the United States to Mozambique. Using the walls of this Italian kindergarten as his canvas, his five murals bring to life bears, birds, a winged lion and more vibrant creations.